I’m not excited for Sonic Colours. No, I’m excited for that Sonic hat that comes with the pre-order. I don’t know why but I must have it. But that has nothing to do with anything (and it’s not a UK pre-order bonus, which makes me sad) so I’ll stop talking about that amazing hat. Either way Sega has recently revealed a new power up, or ‘wisp’ for Sonic Colours. As you can see (except if you’re a colour blinded fool) this is obviously the orange wisp. It’s powers are said to be legendary and a wonder to behold. That, or he just boosts you in the air. Awesome. To be honest, actually I don’t know how this game will turn out. It seems sort of like Super Mario Galaxy what with the power ups and all, but something seems a tad weird for me. I guess it’s just post Sonic ’06 nerves. 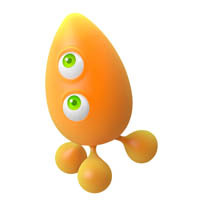 For now we’ll all just have to wonder while Sega slowly reveals more wisps. Sonic Colours is actually the first 3D Sonic game I’ve been excited for in a long time. Sonic Unleashed showed that good 3D Sonic-ing was possible and if this game is mostly just Sonic Unleashed minus the Werehog I will be happy. I echo Alex’s statement–it looks pretty promising! Plus, it’s got giant HAMBURGERS!!! And it’s cool to see them paying attention to small, creative details–like how the wisp for air boosts is shaped like a rocket ship. Those little things add up and contribute to the overall character of a game, and so far this game seems to be nailing it! I agree with both of you. There seems to be a whimsical flavor to the game’s visual style that really has me excited. So far, it looks like it’s not shying away from being a bright, light-hearted little game that relies on fun more than attitude. That’s more than I can say for almost any other Sonic game in 3D (save for maybe the Adventure series). I’m keeping my fingers crossed for this one. The music and the design really feel right with this game, which is a huge deal because I don’t think it’s really felt “right” for the past decade. If it’s just Sonic Unleashed-style daytime levels (as it seems now), then we can be pretty sure it’ll be good! It’s not as exciting as the drill/”laser,” unfortunately. I think I need to see it in action to really understand.